Your Guide to Janmastami Celebrations TOMORROW! ~ The Toronto Hare Krishna Temple! Your Guide to Janmastami Celebrations TOMORROW! Tomorrow, Wednesday, August 28, 2013, marks the biggest spiritual birthday bash in Toronto - Janmastami! Here is a quick guide to help you tomorrow. FREE parking has been arranged for Janmastami festival attendees. 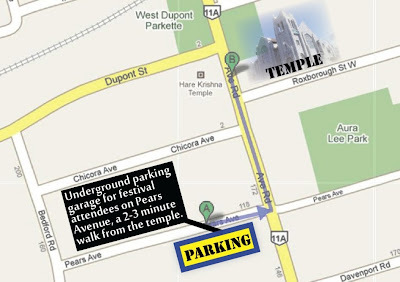 The parking lot is located on Pears Avenue, a 2-3 minute walk from the temple. Free parking is available from 5:00pm - 2:00am. As you can imagine, we have over 1,000 people join us every year for this celebration and we are looking forward to a packed house! To ensure there is less traffic in the building and to keep all shoes in one place, we are trying a new initiative by having all shoes stored outside in our parking lot. Everyone's shoes will be bagged and stored and you will receive a ticket to retrieve your shoes at the end of your stay. As always, we ask for your cooperation as we try to maintain the shoes in an organized fashion. 12:00am - 12:30am: Midnight Arati! We hope you can join us for these auspicious celebrations!